To celebrate the 40th birthday of a dear friend from high school, I wanted to surprise her with a splash of color. 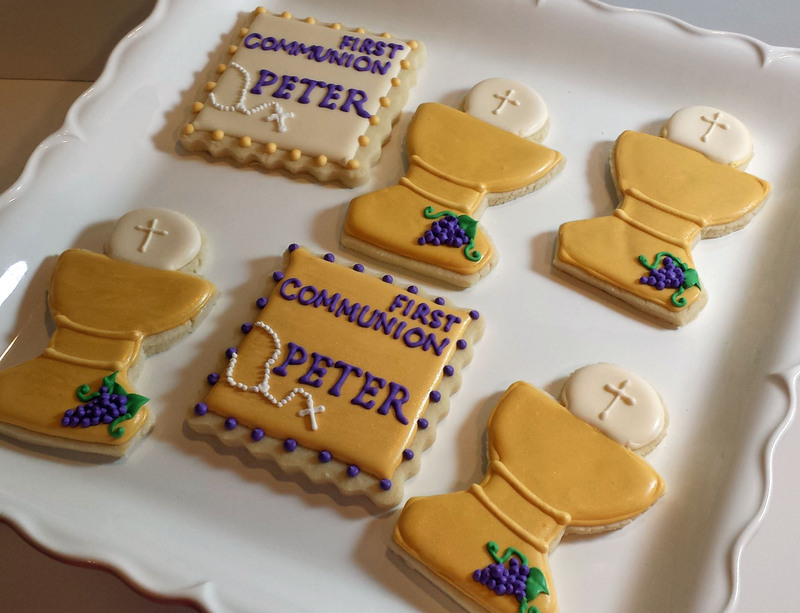 The cookies were inspired by my friend’s amazing skill. Her art talent always marveled me. She painted beautiful images on canvas or doodled fun sketches in notes. I always envied admired her talent. Since all my high school buddies are going through “the change” this year with cresting over the hill to forty, I wanted a little fun to show up in the mail to help get through the day. Because even if their design doesn’t make up for the fact you are venturing into another decade, eating cookies always makes things better. 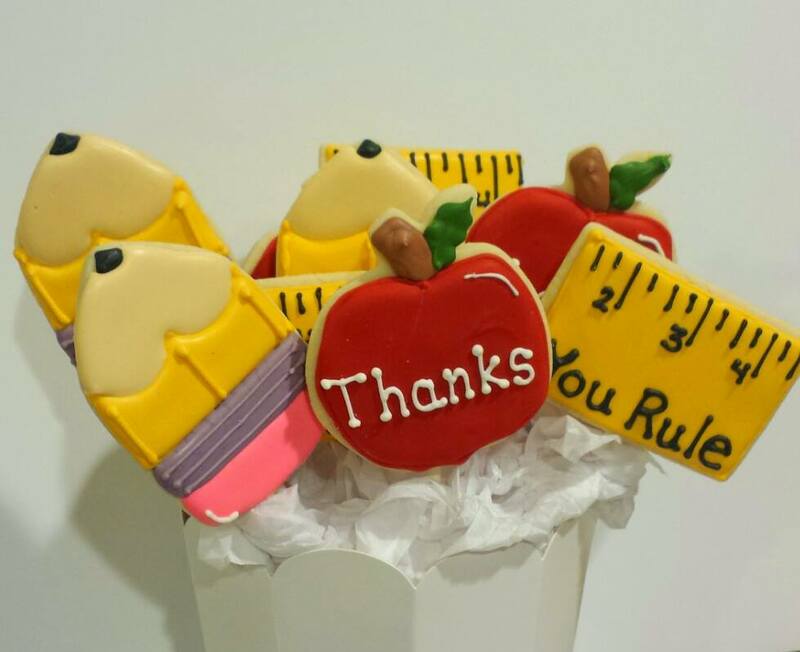 A big thank you to all the teachers who survived another year. This is a little treat I made up for my kids’ teachers. The thank you goes out to everyone. I love creating cookies for my mom. We brainstorm together about what design would suit her need. She marvels at how good they look and is still a little shocked I’m the one who can make them. I did use to burn everything and once (infamously) ruined boxed macaroni and cheese. For the record, I was twelve. I love it most when she wants cookies for her senior golf partners and friends. These women keep my mom feeling young by still swinging the clubs in their 80’s and 90’s. And they love cookies. My mom asked for these to be made special so the ladies knew how much they are cared for by their young friend down the street. They were over the moon excited for the cookies and for having a friend like my mom. I couldn’t agree with them more. Thank you to everyone who give and give and give for our freedom. And a most humbled thank you to all who have died for it. This is a fabulous day for my little nephew Peter. Well, he’s not so little any more. In fact, today he’s becoming a religious man. Okay, well not exactly. 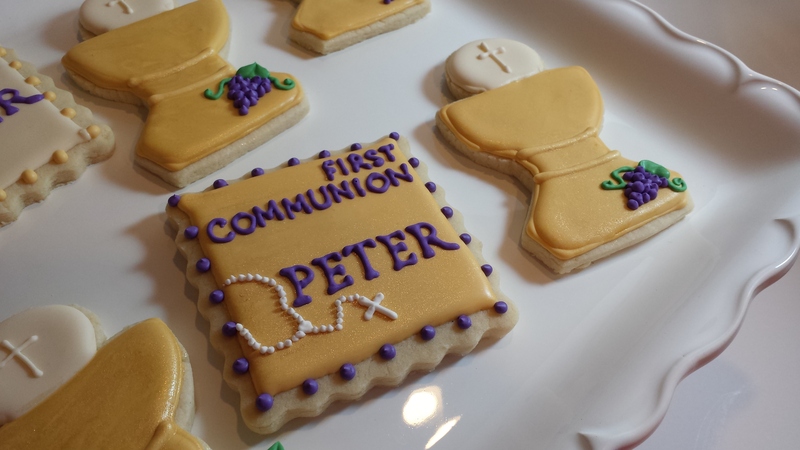 Today Peter is having his first communion. A real right of passage in the Catholic world. An honor in which he is very proud. Peter lives a state away. I wish it was closer so I could squeeze the cuteness out of him and tell him how proud I am of him. Even though I can’t be there, I sent some cookies to share my love. The fabulous Bake at 350 has the step by step tutorial if you too want to share your love with your far away nephews. Or nieces. Who doesn’t love to soak up rays when the sun finally makes an appearance? In our house it means motorcycles. Hubs has one and now my children have little dirt bikes too. I, on the other hand, stick to four wheels. 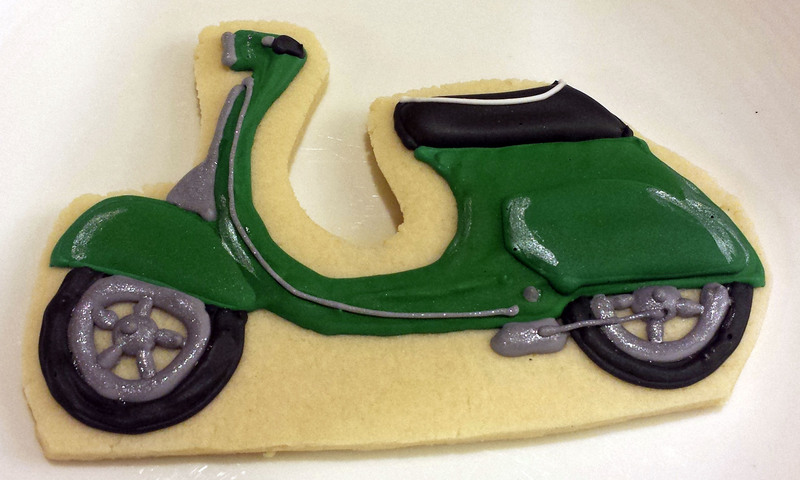 The closest I get to a motorcycle is cookies. And even with that, I only made it to the scooter. Easter is a week away and I wanted to bust out some holiday themed treats. 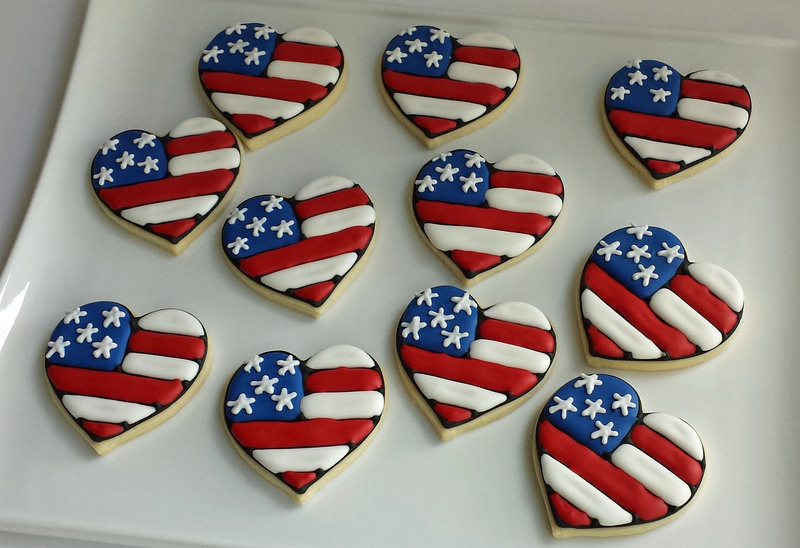 I love 3D cookies. 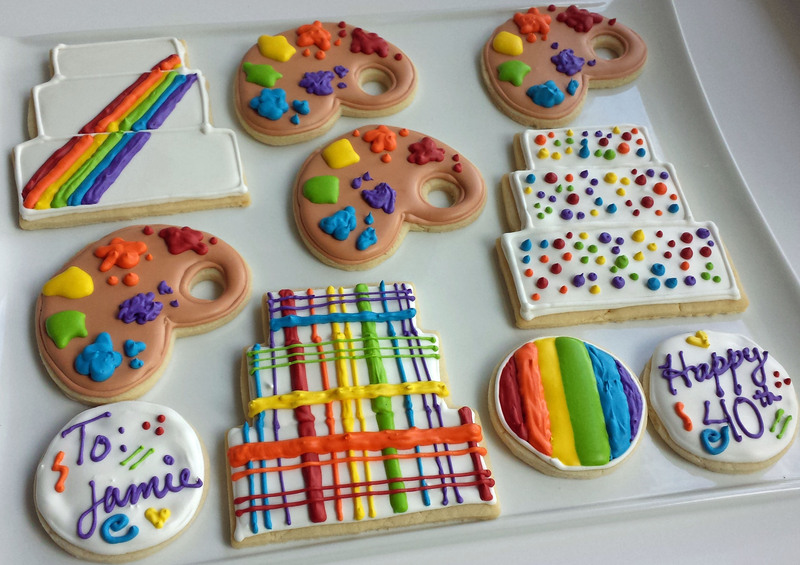 From the moment I saw the pinata cookie, I fell deeply in love with making objects out of cookies. My first attempt at 3D cookie art was a drum set inspired by my fave band, The Airborne Toxic Event. Since then I’ve looked for inspiration to make another cookie stand up. Easter baskets were the perfect muse. Once I had the idea down, design was the next thing. What other color would I choose to make a 3D cookie basket? I wish I could take the credit, but it was my visiting mother who responded quickly with “yellow” when I asked what color basket to make. Start out by cutting out the circles sized to how big you want your basket. Then use a smaller cutter to cut out the inside. 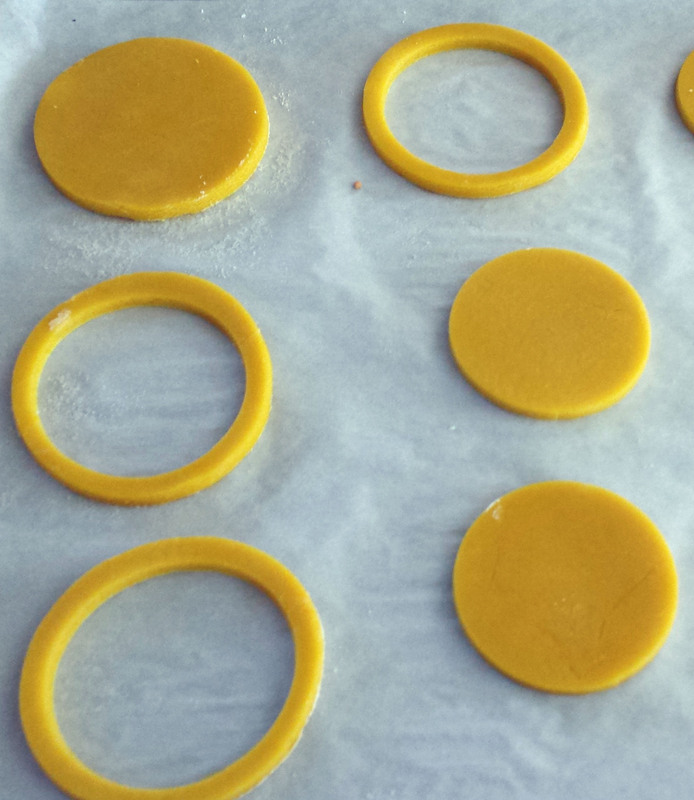 If you’re like me, you’ll bend the fragile circle and have an egg-shaped ring. (See that one in the bottom, left corner?) This may look fine now, but when you try to assemble your basket it will be mis-shaped. 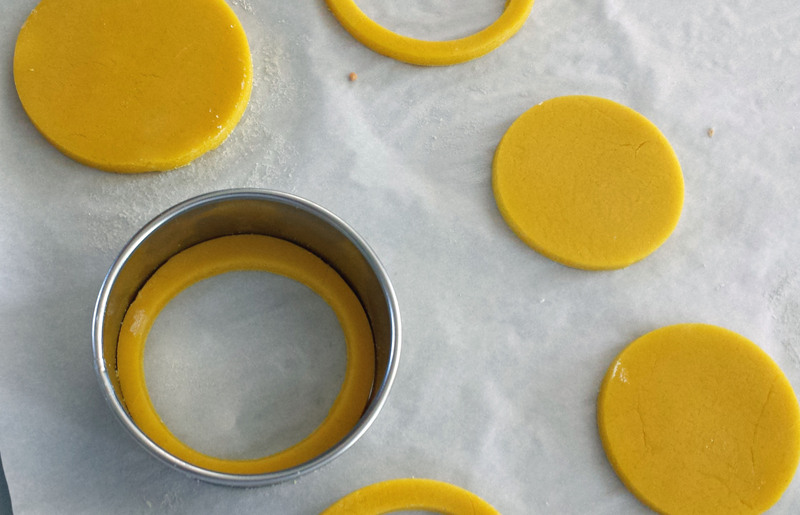 A simple fix is reshape it on your baking sheet with the original cookie cutter. Wiggle it around and work it back to the right shape. Once the icing is dry, use your imagination to decorate the outside as simple or complex as you want. I pulled out some miscellaneous royal icing flowers and dots I had from leftover icing. I put handles on the baskets, but you don’t have to. In fact, one broke in construction and I kinda like that one better. I filled them with green shredded coconut grass. I made some small egg cookies to go inside, but they weren’t cute. Since the kids like to find chocolate in their baskets, I went the easy route and bought chocolate hard-shelled eggs. And it’s not like I minded sampling the hard-shelled chocolate eggs as I created the final product. In the end, the cookie basket and the candy were a big hit with everyone. We finally has a little sun in Oregon and the flowers started to bloom. The warmth sparks many things. The desire to get out in the fresh air, enjoying the new flowers, and overflowing with appreciation. 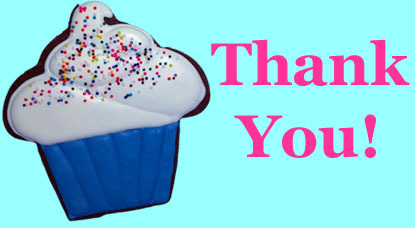 Thank you to everyone for supporting Delish by liking our Facebook page and commenting on the blog. Thank you! Thank you! Thank you! We are so appreciative we had a little contest to show it. And now we have a winner. In our random drawing from the comments, Yvonne was the lucky number. 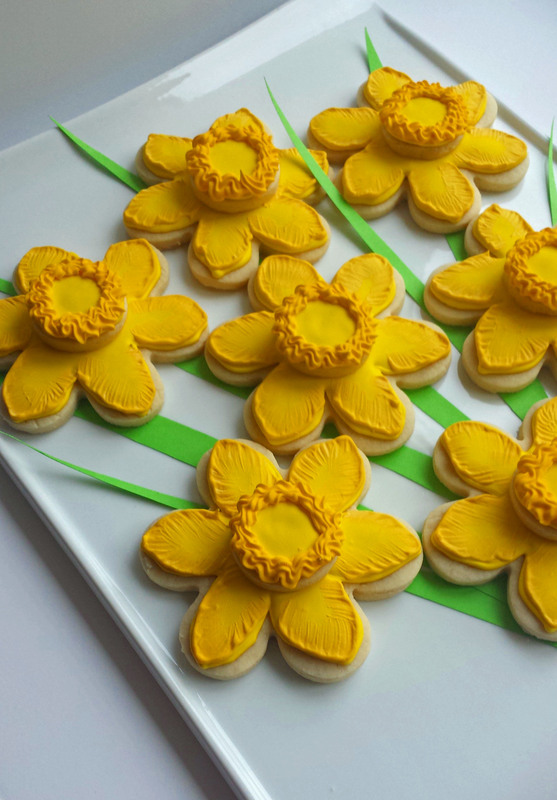 Yvonne wins our spring daffodil cookie bouquet. These are Tia’s favorite flowers and we thought it would be a great way to show you how much we appreciate what you all do for us. Since these will be shipped, we didn’t add the sticks. We hope you will continue to share our name and encourage people to “like” us on Facebook. With more people, we will have more contests. And we hope there will be many more flowers in all of our futures. Last weekend we jumped into the business world with both feet and started a Delish page on Facebook. Nothing is scarier than putting your creative self out there and ask people to “like” you. When the first person hit they liked Delish, we were beyond excited. As it started to grow, our confidence in having a great bakery started to grow with it. Wait, you want more chances than just one? Okay, since you asked. You get another entry if you like Delish’s Facebook page. (If you already have, you need to leave a comment too and then you are entered twice.) More? Because you are so sweet, smart, and beautiful (did I mention how much we love your hair?) AND we appreciate you more than you know, we are going to give you infinite times to enter. If you refer a friend to like us on Facebook and they leave a comment here, have them mention you. If they win, you win too! Yup! Double the prizes. Contest closes March 26th at 6:00pm PST and the winner will be announced soon after. We can’t thank you enough for your support. Feel free to drop us a comment on FB or shoot us a note here. We love hearing from you. There will be more contests, more baked goods, and more oven lovin’ coming your way. 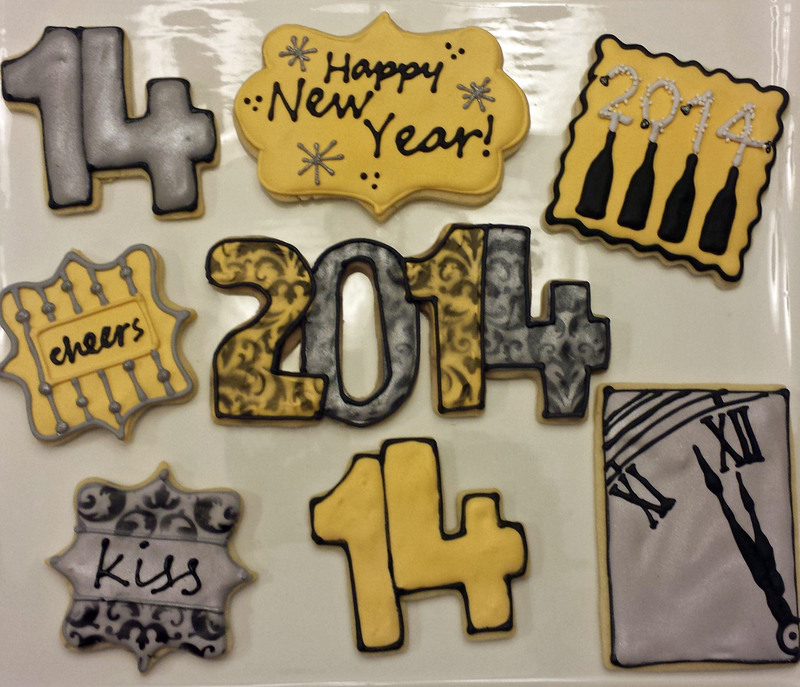 These cookies were created to celebrate the new year. Instead of a bottle of wine as a party attending hostess gift, I made cookies. My inspiration came from a great new bakery site, The Baked Equation. 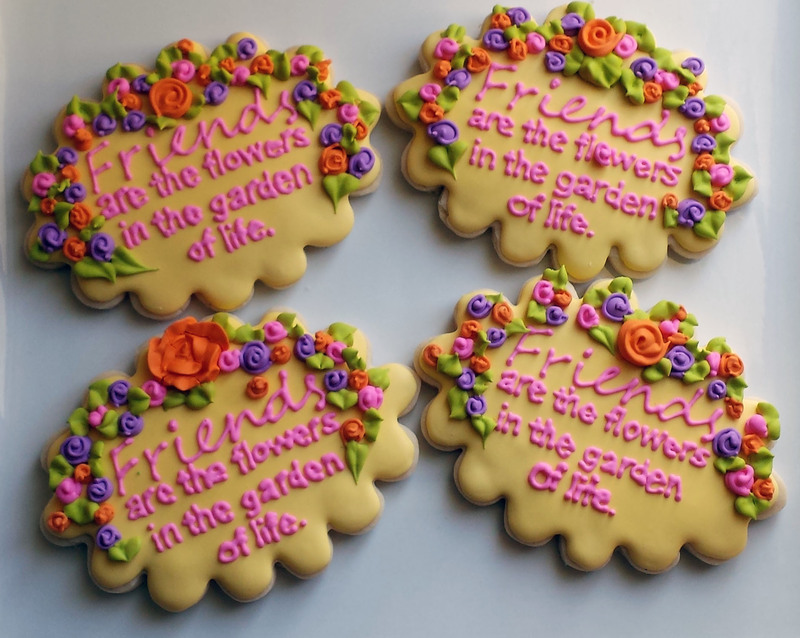 She makes incredible cookie creations I hope to get more inspiration from in the new year. Now, go out and enjoy the new year possibilities. Delish plans to treat you to some more oven lovin’ on the blog and maybe some goodies delivered to your door. We can’t wait to start. We wish you the best in 2014!